I could hardly believe the email message from the BLM in Billings: "Cassidy is at the Billings Livestock Sale barn.” Cassidy, Cloud’s little sister Cassidy? At a kill buyer auction house where bidders buy horses by the pound to take to slaughter in Canada? It took me a minute to wrap my mind around this frightening news. I had known the sweet filly daughter of Phoenix and Diamond since she was a foal. I remember how close she was with her yearling sister, Bella. Aside from Cassidy’s larger star and taller white boot, the fillies were virtually identical. Cassidy’s first stallion was the husky bay, Mateo, who figured prominently in my first Cloud film, "Cloud: Wild Stallion of the Rockies." When Cloud was only four he targeted Mateo, determined to win Mateo's grulla mare, Winnemucca. Their battles dragged on all summer. Toward the end of Mateo’s life, he won the pretty filly, Cassidy. A kind and gentle stallion, Mateo was only tough when he needed to be. When author, photographer, reporter, and wild horse advocate, Hope Ryden came back to Lovell in 2005, Ann Evans and I took her up on Tillett Ridge where she had a conversation with Cassidy and Mateo. I doubt the young mare knew that she and her herd might not be here had it not been for Hope and committed locals in the Lovell area. In the late sixties, Hope Ryden was a reporter for ABC News and a writer/photographer for National Geographic. With the help of local rancher, Lloyd Tillett, she discovered a BLM plan to roundup all the Pryor mustangs and sell them off to “the canneries” for 4 cents a pound! Ryden revealed the plot, and reported it on ABC Network News. Before BLM could carry out their plan Interior Secretary Stewart Udall created the Pryor Mountain Wild Horse Range and the horses were saved. Hope Ryden passed away last year at the age of 87. In her honor we named Jasmine and Doc's son, Ryden. Like his namesake, this Cloud and Aztec, Mateo and Winnemucca grandson is spunky! Forty years after the ABC News Report, another roundup would prove to be the most destructive in the history of this world famous herd. 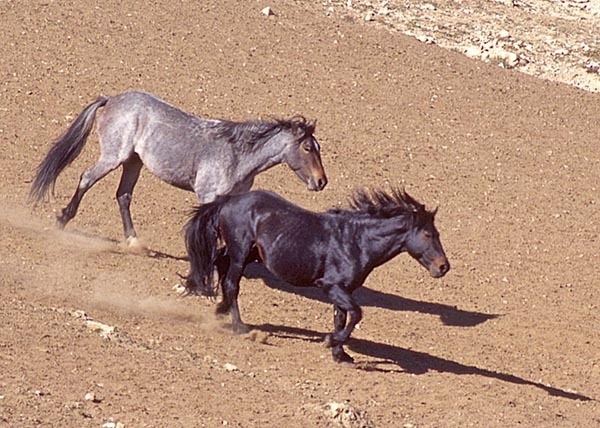 In 2009, 56 horses were removed, the largest removal in the history of the Pryor Mountain Wild Horse Range. Along with older horses that became our Freedom Family, seven year-old Cassidy lost her freedom. At the auction, we were prepared to bid on her if she was not adopted, but she was. The adopter was from Montana and we hoped she had found a good, forever home. That was not to be. Her adopter sold Cassidy and we lost track of her until the email and subsequent phone call from BLM Field Manager, Jim Sparks. Jim said that the brand inspector was at the auction house and thought that the flecks on the mare’s neck looked suspicious. Retired Adoption Lead for BLM, Nancy Bjelland, traveled to the auction house and shaved Cassidy’s neck, discovering the cryptic freeze mark. She identified the mare as Cassidy. Thank you Nancy! And thank you Jim. Immediately after Cassidy was identified, I called one of the best wild horse advocates in the country, my friend, Effie Orser in Emigrant, MT. I asked Effie if she could help, and as always, she said yes. Effie traveled to Billings and picked her up. Here is Effie’s report on the rescue of Cloud’s sister: "Cassidy was sold after the original adopter received title. The person who had her was running her with his bucking stock and then she ended up in a farmer’s alfalfa field in Park City, MT. The farmer contacted the Montana State Department of Livestock and she was removed from the field and taken to the Billings Livestock Sales. 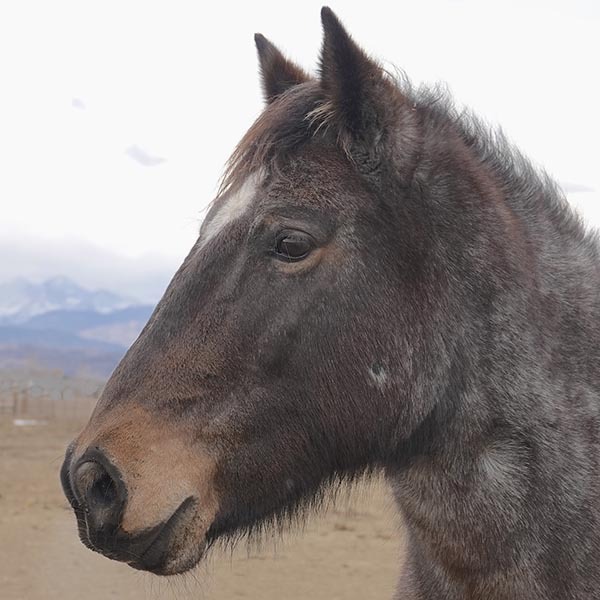 Her owner was contacted and stated that he wanted nothing to do with her, so she was labeled as estray and would have been sold at the next sale per Montana State Law. I picked her up and put her in quarantine. She was a very sick girl. She had an extremely snotty nose and labored breathing for almost three weeks. I could do nothing for her as she was not approachable and would not eat grain or treats. She was also extremely overweight and her hooves were overgrown. After she finally seemed to be getting over being sick she was bitten on the side of her face by a rattle snake. Her face swelled and she was again a very sick girl and I almost thought she might not recover. After all this I brought her home and was able to start working with her." Ann Evans and I visited Effie and Cassidy several months later. Her wariness of humans was still apparent, causing Effie to recommend that Cassidy go to one of the best trainers around. Spencer Dominick in Wilsall, MT has successfully worked with numerous mustangs over the years. Cassidy lacked confidence. But, after several months Spencer won her trust and was able to start her under saddle. We decided it was time to bring Cassidy to Colorado. Ann and I brought her to our wonderful vet, Dr. Lisa Jacobson in Berthoud, CO. Eventually Cassidy will be offered her for adoption. She gets along well with other horses. . . and burros too! Check out this video. I wish Cassidy could tell me about her life and the many hardships she has endured since she was once wild on the Pryors. She deserves a good life and we will make very sure she gets it! P.S. Enjoy some more pictures of Cassidy at Dr. Lisa's with her new friends, including Charlotte Roe and Don Keyote the burro with his mother, Marcella. 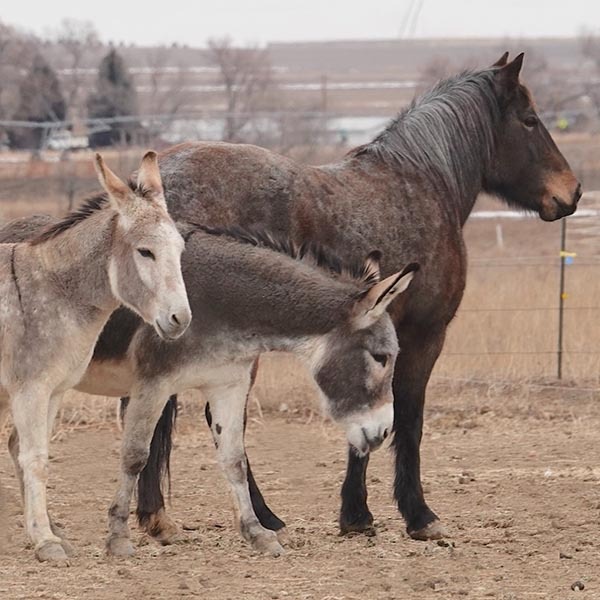 #TakeActionTuesday: Speak Up for Wild Horses & Burros!